Don't confound this regional state of the Zhou period with the Liu-Song dynasty 劉宋 (420-479) of the Southern Dynasties period 南朝 (420~589) or the great Song dynasty 宋 (960-1279). 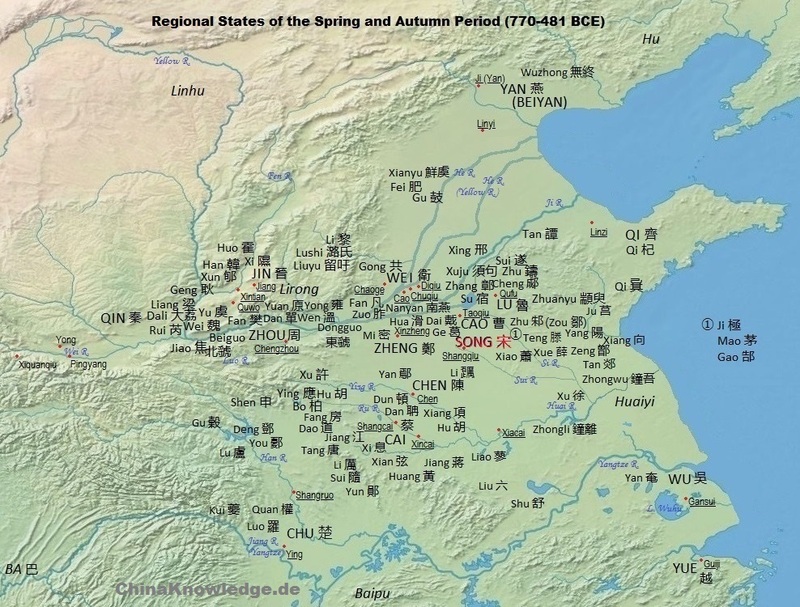 The state of Song 宋 was a regional state of the Zhou period 周 (11th cent.-221 BCE). As a small state of the Central Plain, it had always to cope with the ambitions of the larger states around. Its ruling dynasty were descendants of the Shang dynasty 商 (17th-11th cent. BCE). The territory of Song was located in the southern tip of the modern province of Henan. Map according to Tan Qixiang 谭其骧 (1987), Zhongguo lishi ditu ji 中国历史地图集. Song was located in the eastern parts of the Yellow River Plain and was relatively strong among the smaller regional states. It survived the Spring and Autumn period and was conquered by its eastern neighbour Qi. Click to enlarge. The house of Song was founded by Weizi 微子, who was the oldest son of King Di Yi 帝乙 of the Shang dynasty and an older, yet inferior, brother of the last ruler of the Shang, King Zhou 紂. When King Zhou succeeded to the throne, he proved to be an incompetent and cruel ruler who loved an extravagant lifestyle. Prince Wei several times remonstrated against his brother, but without success. At that time, the Viscount of the West 西伯, Ji Chang 姬昌 (known as King Wen of Zhou 周文王), exerted a virtuous government and began to conquer the western borderlands of the Shang kingdom. Weizi thereupon deliberated whether he should seek death in a last memorial to the tyrant, or leave the country. He explained to the Grand and Small Preceptors (taifu 太傅, shaofu 少傅), the highest ministers of the Shang court, his considerations, and Jizi 箕子, the Grand Preceptor, pursued him to leave rather than to die, because when he lived in exile, Weizi would be able to mount the throne of the Shang one day, while a further memorial to the unteachable king would bring him the death penalty, and the dynasty would be ended definitely. Qizi himself, an uncle of King Zhou, did not leave the country but feigned madness, was enslaved and so survived the demise of King Zhou's rule. Another uncle of the king, Bi Gan 比干, did not survive. For his free criticism he was cruelly executed but cutting out his heart. When Ji Fa 姬發 (posthumous title King Wu of Zhou 周武王), son of the Viscount of the West, defeated the army of the king of Shang in the battle of Muye 牧野, Weizi brought the sacrificial tools of his fathers to the camp of Ji Fa and offered his submission. Ji Fa accepted and promised to give him a high position. When the Zhou dynasty was founded, King Wu appointed the late King Zhou's son Wu Geng 武庚 (Lu Fu 祿父) as righteous successor of the dynastic line, and gave him the territory of Bei 邶. Wu Geng was assisted by Guan Shu Xian 管叔鮮, regent of Yong 鄘, and Cai Shu Du 蔡叔度, ruler of Wei 衛. Both were half-brothers of King Wu. King Wu, now ruler over China, asked Jizi for advice, and the latter explained to him the power of the Five Processes 五行 that influenced the whole cosm as well as the kingdom and the lives of men. The explanation of the Five Processes and their effect is narrated in the history Shiji 史記 as well as in the chapter Hongfan 洪範 in the book Shangshu 尚書. King Wu, having learned about the functioning of the universe, made Jizi regional ruler of the eastern country Chaoxian 朝鮮 (Korea), yet without counting him as a regional ruler (zhuhou 諸侯). In Korea, Jizi is known as Kicha. When King Wu died, his young son King Cheng 周成王 mounted the throne. Late King Wu's brother, the Duke of Zhou 周公, thereupon took over regency for the under-age king, but Guan Shu and Cai Shu suspected the Duke of usurpation and instigated Wu Geng, nominal head of the descendants of the former Shang dynasty, to rise in rebellion. Their army was defeated by the Duke of Zhou, the three traitors were executed, and Weizi was named head of the Shang dynasty and made regional ruler as Duke of Song. His investiture is reported in the chapter Weizi zhi ming 微子之命 in the book Shangshu. He was willingly accepted by the people of the Shang because of his virtuous conduct. His line continued as the rulers of the regional state of Song. Duke Xuan 宋宣公 (r. 747-729) had a crown prince called Yuyi 與夷. Yet when the duke fell ill, he summoned his younger brother Prince He 和 to his bed and entrusted to him the throne. When the duke died, Prince He, posthumously known as Duke Mu 宋穆公 (also written 宋繆公, r. 728-720), had a conversation with his Minister of War (da sima 大司馬) Kong Fu Jia 孔父嘉, in which he said the after his death it should be Prince Yuyi to whom the throne should fall, yet Kong Fu explained that all ministers preferred Prince Feng 馮, Duke Mu's own son. Yet the Duke did not want to offend his brother's soul and therefore sent Prince Feng to the state of Zheng 鄭 and managed the enthronement of Prince Yuyi, who is posthumously known as Duke Shang 宋殤公 (r. 719-711). Under his reign a years-long conflict with the state of Zheng erupted. The war was caused by an usurpation in the state of Wei, whose ruler feared an attack by Zheng and therefore sought alliance with Song. Kong Fu Jia's wife was very beautiful, and Counsellor-in-chief (taizai 太宰) Hua Du 華督 therefore wanted to possess her. In order to get rid of Kong Fu Jia, he slandered him by attributing the sufferings of the country under the long period of warfare with Zheng to the politics of Kong Fu Jia. Hua Du assassinated Kong Fu, kidnapped his widow, and immediately thereafter killed Duke Shang who had been enraged about this impertinence. Hua Du invited Prince Feng to mount the throne. He is known posthumously as Duke Zhuang 宋莊公 (r. 710-692). Hua Du as counsellor to the Duke had a great influence on politics and even controlled the succession in the state of Zheng. His son was Duke Min 宋閔公 (also written 宋愍公, r. 691-682). Under his reign, during a campaign against the state of Lu 魯, minister Nangong Wan 南宮萬 was captured and only released when the Duke heavily insisted in his release. Somewhat later, during a hunt, the Duke insulted Nangong Wan as a former "prisoner of Lu". The minister thereupon decided to kill the Duke. The noble Qiu Mu 仇牧, who wanted to defend the ruler, was killed at the gate, likewise counsellor Hua Du. Nangong Wan thereupon enthroned Prince Ziyou 子游 as the new ruler of Song. Prince Yuyue 御說 fled to Hao 毫, other princes to the small state of Xiao 蕭. Nangong Wan's brother Nangong Niu 南宮牛 besieged the town of Hao, but the princes united their forces and were able to kill Nangong Niu and returned to Song, where they killed Prince Ziyou and enthroned Prince Yuyue as the new ruler of Song. Nangong Wan fled to the state of Chen 陳, but Yuyue (posthumously known as Duke Huan 宋桓公, r. 681-651), managed to have Nangong Wan handed over, made him drunk and wrapped into a cow hide. He was cruelly chopped to death. Duke Huan was able to dominate the succession in the weak state of Wei and married the sister of Duke Wen of Wei 衛文公 (r. 659-635). When Duke Huan fell ill, Prince Zifu 茲父 (also written 茲甫), planned to cede the right of succession to his older, yet inferior, brother Muyi 目夷, but the latter refused the position of heir apparent. In the end, Prince Zifu mounted the throne, while Prince Muyi became his chief counsellor. Zifu is known as Duke Xiang 宋襄公 (r. 650-637). When the hegemonial lord (ba 霸) Duke Huan of Qi 齊桓公 (r. 685-643) died, Duke Xiang of Song invited the regional rulers to swear an alliance at Lushang 鹿上. With this conference Duke Xiang planned to take over the position of hegemonial lord, yet Prince Muyi warned him against such a step with the argument that a small country like Song would not be able to fulfill this duty appropriately. On a meeting with the regional rulers at Yu 盂, the king of the powerful state of Chu 楚 arrested Duke Xiang and only released him a few months later. Immediately thereafter, Duke Xiang attacked the state of Zheng, an occasion that minister Ziyu 子魚 interpreted as the origin of the disaster that Prince Muyi had predicted because the large state of Chu soon dispatched an army to bring relief to Zheng. Duke Xiang awaited the army of Chu at River Hong 泓 until they had formed their battle arrays, in spite of Prince Muyi's urgent plea to attack them while crossing the river. This gentleman-like behaviour ("only attack the enemy when he has completed the battle array") cost Duke Xiang the victory. The duke of Zheng feasted the victor and his saviour, King Cheng of Chu 楚成王 (r. 672-626), but the latter, when leaving, seized the two daughters of the duke and with this insolent behaviour violated the right of hospitality. Duke Xiang granted asylum to Prince Chong'er 重耳 of the state of Jin 晉, and knowing that the prince might become duke of Jin one day, decided to support him, in order to have an ally against the state of Chu. Prince Chong'er later mounted the throne as Duke Wen of Jin 晉文公 (r. 636-628). When Duke Xiang died, he was succeeded by his son Prince Wangchen 王臣, who is known as Duke Cheng 宋成公 (r. 636-620). When Chu attacked Song in 633, Duke Wen of Jin sent a relief army to help Duke Cheng. When Duke Cheng died, his younger brother Prince Yu 禦 assassinated the crown prince and the Minister of War, Gongsun Gu 公孫固. Yet Yu was killed soon, and Duke Cheng's son Prince Chujiu 杵臼 mounted the throne. He is known as Duke Zhao 宋昭公 (I, r. 619-611). Duke Zhao was an inapt ruler, but his younger brother Prince Baoge 鮑革, a decent and worthy man, did not want be given a higher position in government. Yet in the end, he became successor of Duke Zhao when the former was assassinated during a hunt by a certain Wei Bo 衛伯, who had been instigated by the Duchess Dowager of late Duke Xiang. Prince Baoge is known as Duke Wen 宋文公 (r. 610-589). Baoge's name as a person of great virtue saved him from being charged with murder, yet the descendants of the late dukes rebelled against the usurper. Duke Wen executed all rebels and had exiled their relatives. The king of Chu ordered the duke of Zheng to attack Song. General Hua Yuan 華元 was taken prisoner, and Zheng claimed ransom, yet Hua Yuan was able to escape. In 595, Duke Wen took the envoy of Chu prisoner, so that King Zhuang of Chu 楚莊王 (r. 614-591) decided to besiege the capital of Song. After five months of siege, the people of Song were near starvation. Hua Yuan at night visited the camp of King Zhuang and reported to him the grave situation in Song, yet in a somewhat exaggerated form. The king, his army being short of grain itself, thereupon lifted the siege and returned. Duke Wen was succeeded by his son Prince Xia 瑕, who is known as Duke Gong 宋共公 (r. 588-576). Under his reign, Hua Yuan was able to establish good relationships with general Zichong 子重 of Chu and general Luan Shu 欒書 of Jin, so that no war threatened the state of Song. When Duke Gong died, the Minister of War, Tang Shan 唐山, killed the heir apparent Prince Fei 肥 and wanted to kill Hua Yuan, who was Commander to the Right (youshi 右師). When Hua Yan was about to flee, the Commander to the Left (zuoshi 左師) Yu Shi 魚石 arrested and executed Tang Shan. The next ruler was a minor son of Duke Gong, Prince Cheng 成, who is known as Duke Ping 宋平公 (r. 575-532). His reign was long and peaceful, except for an invasion by Chu that occupied the city of Pengcheng 彭城 and appointed Yu Shi grand master (dafu 大夫) of that territory. Prince Zuo 佐 was the next ruler, known as Duke Yuan 宋元公 (r. 531-517). Duke Yuan had executed all princes of Song, descendants of the former dukes. The families Hua 華 and Xiang 向 thereupon rose in rebellion and brought turmoil to the state of Song. Duke Yuan died on the way to Lu to support the re-enthronement of Duke Zhao 魯昭公. His successor was his son Prince Touman 頭曼, who is known as Duke Jing 宋景公 (r. 516-451). During his reign, Confucius 孔子 visited Song and was nearly assassinated by Minister of War Huan Tui 桓魋. In 487, Song attacked and occupied the state of Cao 曹.
Duke Jing was succeeded by Prince Te 特 (or De 得 or De 德), who is known as Duke Zhao 宋昭公 (II, r. 450-404). Prince Te was a great-grandson of Duke Yuan. His father, Gongsun Jiu 公孫糾, had been killed by Duke Jing, for which reason Prince Te killed the heir apparent when Duke Jing had died, and usurped the throne. Duke Zhao was succeeded by his son Prince Gouyou 購由 (or Gouyao 購繇), who is known as Duke Dao 宋悼公 (r. 403-396). The last century of the ruling dynasty was quite a peaceful time for the state of Song, and it did not play a role in the conflicts of the Warring States period 戰國 (5th cent.-221 BCE). Prince Ticheng 剔成, duke of Song (r. 369-329), was exiled by his younger brother Prince Yan 偃, who usurped the throne and was to be the last ruler of Song (r. 328-286). In 318, the duke adopted the title of king. He is therefore known as King Kang of Song 宋康王. He did not only conquer some smaller states like Teng 滕 and Xue 薛, but was even able to defeat the large states of Qi in the east and Chu in the south, and routed the troops of the young state of Wei 魏 in the west. Yet his indecent and extravagant lifestyle caused people to compare him with the ancient king of Shang, King Zhou, who had once ruined his dynasty. In 286 therefore, an alliance between Qi, Wei and Chu was created, and the state of Song was conquered. While the territory of Song was divided into three, King Yan was killed and the dynasty ended. The name of Song was used for many imperial princedoms, for one of the Southern Dynasties (Nanchao 南朝: Liu-Song 劉宋), and for the great Song Dynasty. Lu Fu Yin 祿父殷, son of King Zhou 紂 of the Shang 商, posthumously called Wu Geng 武庚, made ruler of Bei 邶. He rebels against King Cheng of the Zhou 周成王 and is executed. His territory was given to Huo Shu 霍叔, a brother of King Cheng. Shiji 史記, 38, Song Weizi shijia 宋微子世家. Luo Shilie 羅世烈 (1992). "Song 宋", in Zhongguo da baike quanshu 中國大百科全書, Zhongguo lishi 中國歷史 (Beijing/Shanghai: Zhongguo da baike quanshu chubanshe), Vol. 2, 970.